RÉVÉLATION TROCADÉRO – Crêpes adorées, je vous cherche dans tout Paris, désespérément. Attendez un peu, vous avez déjà essayé le Grenier à Pommes ? Cela va vous changer de ces morceaux de cartons réchauffés au micro-ondes… Je prends mes jambes à mon cou, direction rue de Longchamps. QUALITÉ ET CONVIVIALITÉ – Coquet, Le Grenier à Pommes a trouvé une place dans le coeur des habitants du quartier, réputés exigeants…. Les aventuriers de la crêpe et de la galette peuvent donc s’y rendre sans arrière-pensée. La variété est belle, la dégustation sans faille, avec une bolée de cidre brut. SERVICE AGRÉABLE – Malgré son succès, Le Grenier à Pommes garde la simplicité des débuts. Le service est efficace et courtois. Very poor Service. Salad was Missing. We did Not get the Discount. Very expensive. Overall OK experience in this very small place with a nice atmosphere and well located. They do not speak english and that's not good but for sure it's easy to understand/order. Food quality OK. Excellent service: wait staff were efficient and friendly. 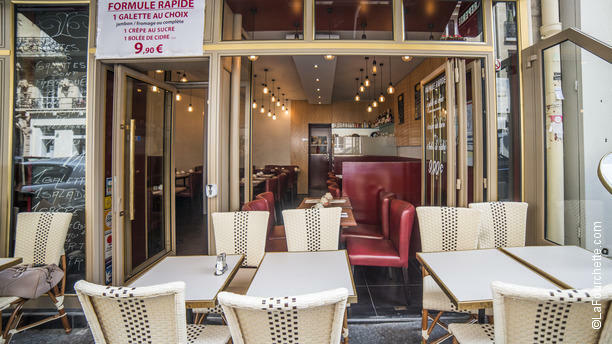 Fresh ingredients and reasonably priced, notably for this area of PARIS. Let's start from the fact that the waiter or owner(I am not sure) can't speak English so it was impossible to communicate and understand in what ways the fork sale wasn't applicable on the menu. In the end we ordered two items on the menu and the sale wasn't applied anyway and any attempt to understand way or contest was futile because of the lenguage barrier. Super petit restaurant. Service au top. it's a very nice (crêperie) , the food was excellent and the service was very good too . I highly recommend you to try it ! Very nice atmosphere, people who work there are very friendly! A big crepes variety is offered! I can't wait to back there again! crepes were okay. not enough chicken in cesar and not enough beef in texane. desert crepes way too sweet. over priced. We got to the empty restaurant, 2 adults and a toddler that barely eats anything (and so we ordered a place for two). The workers said we have to order 2 crepes per person, *including the toddler*, in order to benefit from the discount. We gave up and decided to have a single savory dish each. The reason for that was, according to the waitress, that we took a table of 4 people after reserving for 2. It would have made sense if the restaurant wasn't EMPTY (there were 2 more people when we left). My husband and I wanted to order salads, but when we tried ordering them, we were told "we have no salads today" - even though all of the components in the salads were also in the crepes. Okay... so we ordered crepes (that came with a small salad on the side, which made us baffled about the lack of salads). The savory crepes were okay, no more than that, and were not of the regular savory type (buckwheat flour), but of regular flour, which just added to the annoyance we already felt. So many good places to eat in Paris, do not waste your time here. Dommage! Nice staff, good location and very good crepes! Delicious! Great service! Love it! Wonderful experience! Very friendly service, delicious crepe. The Grenier crepe was absolutely delicious with pommes de terres, onions, miel, and poulet. We will go back there 100%!! Thanks!